The following snap shots chronicle Peter Daniel's ongoing fascination with chip amps by way of samples of different cosmetic and circuit iterations he's explored for the last 2+ years. 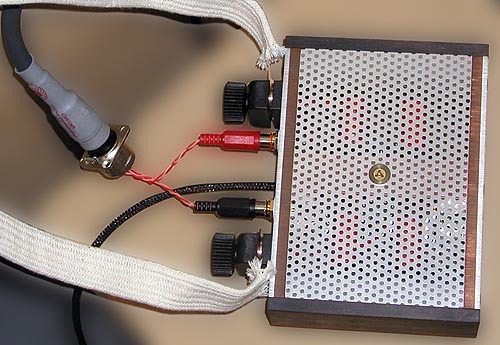 Daniel has also built himself a Nelson Pass Aleph amplifier, naturally customizing certain bits from the schematics published on DIYaudio.com [below]. Hanging a U-turn on memory lane to return back to the future, we finally arrive at July 27, 2005 - the birth of the first production Patek in SE guise, Daniel's current flagship effort in the chip realm. Though he would have built them regardless, I feel like a -- very minor -- patron of the arts. My little commission supported an Old World handcrafter and perhaps helped kick off this particular project a week sooner than it might otherwise have gotten underway. Tell you what, for a change, that's a whole lot more gratifying than buying a major Corporation's anything off the rack as it were. 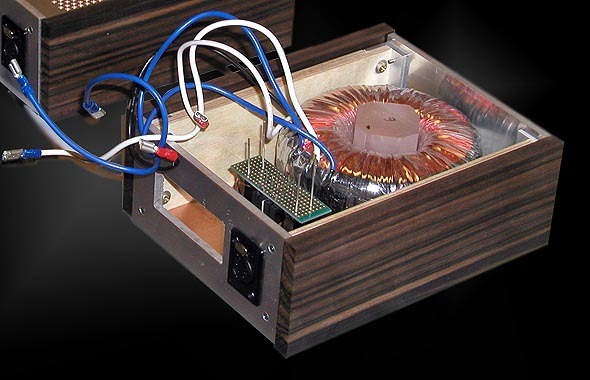 This is how the power supply starts life - as a copper ground plane and empty chassis. The transformer primaries and secondaries still await their connections to the proper circuit junctures and the umbilical Neutrik socket that feeds the amp proper. To recognize what, exactly, we're looking at, I asked the master chef to itemize his ingredients for the Patek SE including basic performance specs: "300VA single primary, dual secondaries transformer. Black Gate STD main filter caps, dual MUR860 bridges, Cardas umbilical cord with 4-pin Neutrik connectors. Gold-plated PCBs, Caddock and Riken resistors with BG N-type 100/50 bypass caps. 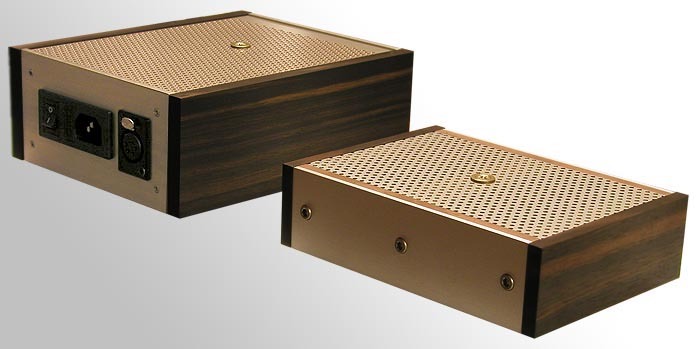 Copper/aluminum chassis, Maple sub panels painted with conductive nickel coating and Madagascar Ebony dress panels. Aluminum mesh on top and bottom to avoid vibration and improve heat dissipation. The central copper bar provides main structural support, acts as a heat spreader to all 4 panels and with a direct-coupled single brass spike, provides a one-point energy release pathway from all metal components of the chassis (the other two spikes are connected to the wooden panels). Non-magnetic, aircraft type hardware used throughout." 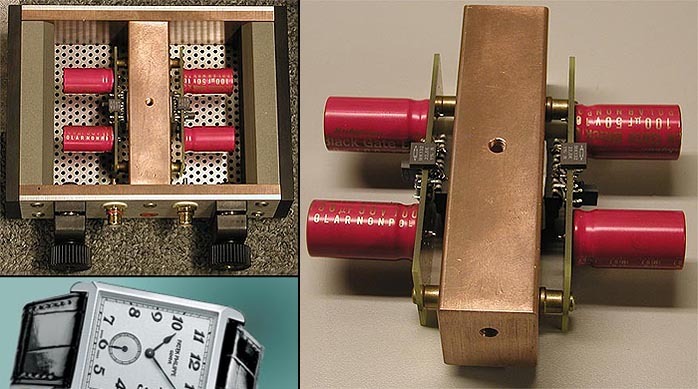 Using Cardas' patented binding posts where one solid block clamps down on both hot and return spades with a single large knurled screw, the Patek SE is covered by a perforated aluminum plate just like the supply to assist ventilation. Very big on mechanical and electric grounding and the sound of materials (copper, wood, aluminum, brass), Peter Daniel taps the single conical front footer directly into the massive central copper bar [lower left] while the two rear footers couple to the wooden side rails tucked behind the externally visible hardwood dress cheeks. Nothing here is arbitrary or capricious. It's all about uncompromised circuit tuning and precision execution while maintaining simple yet attractive cosmetics. Nothing is bigger than it needs to be. This is in keeping with the whole concept of miniaturization and simplification though the National chip at the heart of the circuit is anything but simple. Think manual-movement Swiss lady's watch - slim and small yet loaded to the hilt in ways that boggle the mind of everyone not in the trade. The Patek is all about stripping away the superfluous and making the essentials that cannot be discarded count for all they're worth. Relying on a single op-amp, this limits output power and, unlike super amps, doesn't keep doubling into 1 ohm. 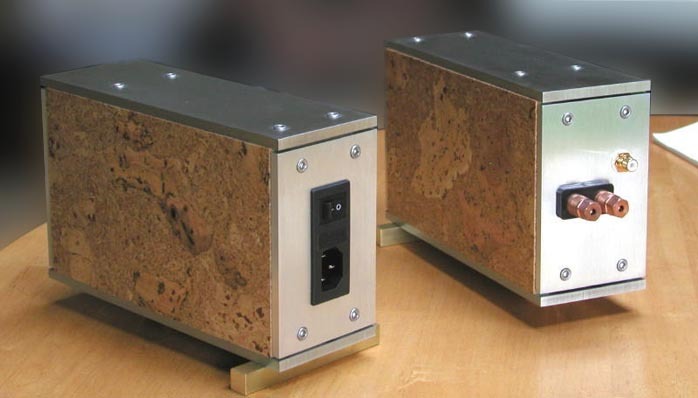 While nowhere near as critical as with micro-power S.E.T.s, speaker matching still remains the responsibility of the end user. 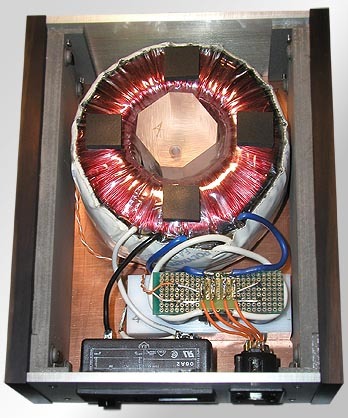 So-called brutal loads should be regarded with suspicion not so much for max output levels -- 50 watts could well be plenty -- but to insure optimal control into wide impedance swings and erratic phase angles. 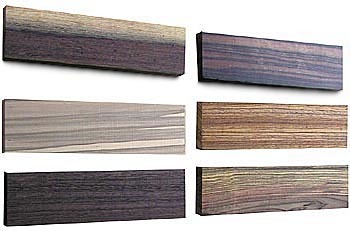 custom length for the umbilical (2' recommended). Certain options may carry parts-cost surcharges and interested parties should simply contact the maker for a quote.